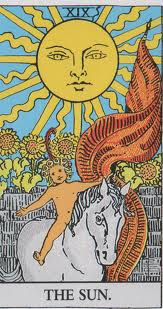 The Sun card is often seen as one of the most positive cards in the Tarot deck. It often signifies clarity, honesty and optimism. it suggests a bright outlook, not necessarily that everything is entirely problem free, but that everything is out in the light of day. Nothing is hidden in the shadows here and we can bask in the light of reason. It's a curious thing that so often difficulties and worries are accepted as facts of life and negativity seems to need little justification. Happiness is sought and sold to us as elusive. I don't buy into that. There is never a moment when the sun stops shining on the earth. True at night we turn our backsides to it and things like clouds and pollution obscure it momentarily. Some would be quick to mention that the sun, as a physical entity, has a life span. Like other stars it will eventually burn out. But the very light of the stars goes on shining and ever moving outward long after their demise. Some stars that are visible to us burnt out long ago, the light continues to move forward. Even what we see as a lower life form knows this. Plants evolve to capture light. Sunflowers (which are depicted more than once in the Rider Tarot as a symbol of self -honesty) adjust daily to follow and soak up the sun's rays. Dandelions manage to root into concrete and stretch to absorb light. Happiness is our connection to that sort of life force. When we are happy we radiate a kind of energy that is positively infectious and it continues to move forward. This is our natural state. We forget it and get preoccupied. We often buy into the lie that we need to have things or the right conditions or the right relationship in order to be happy, but there are moments where we get to forget that (probably what St. Francis of Assisi meant in "self forgetting") and experience this. It is what C.S. Lewis meant in the business of being "Surprised By Joy". Don't get me wrong, there's nothing wrong with wanting things, it's when the wanting hurts that we are out of line. Relationships are a prime example of this, when we want a relationship in order to be happy our odds aren't as good as when we want to share the happiness we do have with someone. Some many years ago I was in a group that was trying to do some conscious inner work. We were working very hard at trying to be HAPPY people and there was a lot of focus on what our problems were. Some felt that they had repressed issues they needed to get in touch with and while in some areas this is a valid thing, it was also a bit of a blame game. I found myself questioning my childhood. Was there something I was blocking? Something I needed to "get in touch with"? I wondered, and at the time as I was distant from my father (and had blamed him for some things) it was a question of what did I maybe have bottled up that I needed to see. I talked to some people and fortunately someone very wise said "maybe you're so focused on the negative that you're blocking the positive". Well at first I found that annoying, (frankly I was in such a state that I found A LOT annoying those days), but it stayed with me. A few days later I was out with a friend and he asked me to pass him something on the table and as an off the cuff remark he called me sunshine..."could you pass me that sunshine". 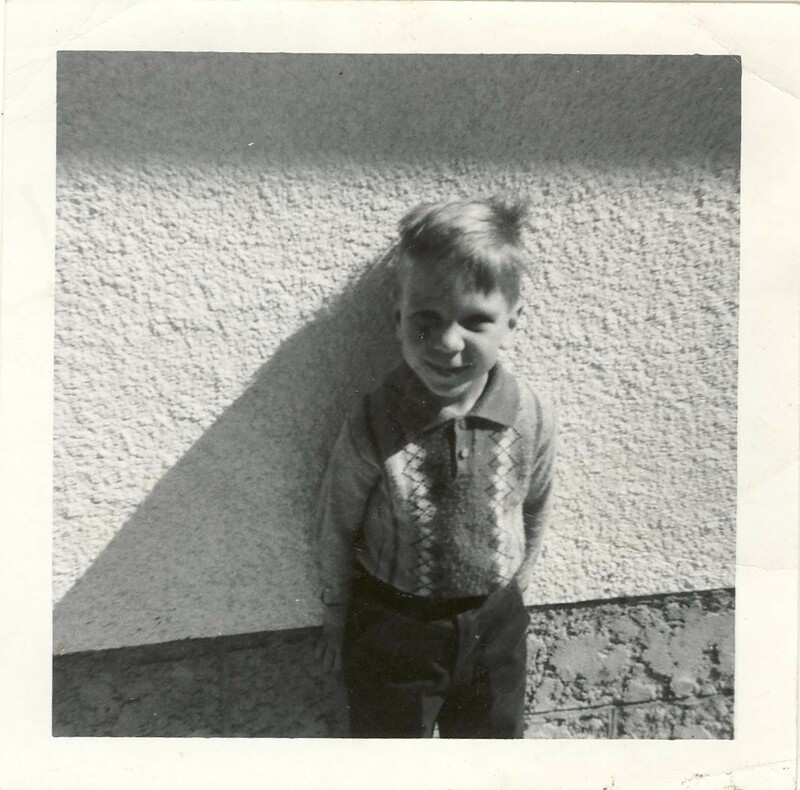 It hit me like a bolt from the blue...when I was very young my dad called me sunshine. I had forgotten that, along with a lot of other very positive little things he had done or said. It was at that time I began to re-connect with my father and came to have a happy relationship with him, he passed away peacefully in 2005 and I was with him when he did. Another thing this reminds me of; a friend was going through a really tough time, a genuinely hard, tough time. Her partner had left her, had taken everything (even the dog), she was living in a hotel room, she was faced with so much uncertainty and had every justifiable reason to feel low. We were sitting in her car (which she was on the verge of losing) and she was talking about how tough things were. I didn't have any platitudes to offer (I'm bad for that - sorry). Something told me to just shut up and listen (and thankfully I did). She eventually just fell silent and we were staring ahead down the street. We were parked near my work on College street. Some grubby little kids (about 4 to 6 years old) were playing with an old tire they'd found. They found it uproariously funny to roll that old tire down the street. We just found ourselves watching and after a while when they laughed, we did too. My friend was very okay after that (maybe she just needed to see she was okay all along) still she had rough times but she came through them. I believe happiness is what children know and what we misplace (but I believe we never really lose). This sort of thing has happened for me again and again, not on demand, not instantly, but often enough for me to know (but still need reminders), that happiness is a natural state. It does not distract us from grief, it does not solve everything, but it's there. We allow ourselves moments, we need reminders, we get preoccupied, some of us get very lost, there are dark states that can be quite lethal, but in those instances especially I believe that spiritually we all eventually find our way into the light. December in Winnipeg. The shortness of the days. The crisp mornings and long twilight of the afternoons. It's a season of extremes. The holidays are a time I look forward to. 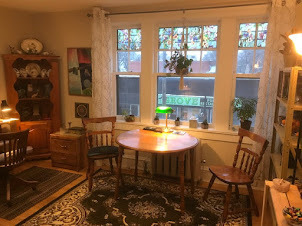 For me this is a time of year where the focus is more about just getting together with people, renewing connections and catching up. Professionally it's my month of greatest extremes. December is usually quiet through the early part of the month and then a scurry of people wanting to get in while they are off work. It's also very nice to see people who visit from out of town. Some people make coming for a reading part of their holiday tradition! In my own family the kids are grown, there's not a lot of presents to buy (other than for my Mother) and, thankfully, most of us have what we need. A few years ago we started putting the emphasis more on just getting together. I don't much relish the craziness of shopping. I also volunteer a bit around different community areas. I usually help decorate a community centre and other stuff. For a lot of people this season is challenging. Maybe because there's so much thrown at us about how it OUGHT to be and it's easy to feel we have fallen short if we aren't living some sort of Hallmark card version of the season. Also we often see a lot of old patterns arise as we go "home for the holidays". I see a lot of struggle 'round this time of year, but I also see a lot of progress and hope. One of the symbols of the season that I have come to have a different appreciation of is the little nativity scene my mother puts out every year. She often threatens to give it away and I always get antsy when she does. It's one of our little struggles but it means something to me. She bought it when she worked at Eaton's back when I was very little. Eaton's was an amazing big old department store in it's day. The toy land at Christmas was (in my memory) a huge otherworldly adventure. It didn't have the same feel as the big box stores of today. Amid all the over the top stuff that our family went through at Christmas time, the little nativity scene or "creche" as my mom calls it, is one of the few things still around. The papier mache figures that have survived many moves and jostling. I think we lost a barnyard animal or two and St. Joseph has a chip on him. The year our basement flooded we found the box waterlogged. Mom very carefully unwrapped each figure and let them dry, they could have crumbled at the touch. My mom always did her best to make Christmas special for us ( I have three older brothers). In the years when she was a single parent, working secretarial jobs and, for the last while as an inspector on an assembly line in a computer plant, she did her best to keep things together. By the time I was about 13, my older brothers had moved out and it was just her and I for a few years. I remember one afternoon about this time in December, I was home alone after school and there was a knock at the door. A guy from the Christmas Cheer board was there with a hamper. I thought he must have the wrong address and told him so. He had our names and suggested I call my mom and check before going away. I called my mom at work and when she heard why there was a long pause and she said "it's not a mistake". I had not known at the time how hard some things were. Someone had submitted our name for that turkey. What that little Nativity scene represents to me more than anything now, is endurance, survival and hope in times of challenge. I'm looking forward to spending time with my mother this holiday season, like the little creche, we've come through a lot. In a few weeks the days get longer again. Whatever our individual spiritual beliefs and traditions, it is a time for renewal and appreciation of what we have, what we can share and what we are here to do. To all my friends and clients, best wishes of peace, comfort and joy and to a good new year, cheers!